Brachial plexus is sub-divided from proximal to distal into: Roots, Trunks, Divisions, Cords, Branches. This can be easily remembered with a mnemonic: Randy Travis Drinks Cold Beer. Before going into details of approaches – it’s always a good idea to have knowledge of applied anatomy of brachial plexus. Landmark: At the level of the C6 vertebral body (Chassaignac’s tubercle) between the anterior and middle scalene muscles, i.e. interscalene groove located deep to the lateral (clavicular) head of sternocleidomastoid; C6 corresponds to the level of the cricoid cartilage. 1. It is deposited around the upper roots (C5, C6) that innervate the muscles of the shoulder. 2. Due to the vertical distribution of the roots at the point of injection, the C8-T1 roots are often missed. 3. Occasionally, there may be proximal spread to the cervical plexus (C3, C4) and cervical sympathetic chain, which can result in Horner’s syndrome and hoarseness post block. 4. This block always results in hemidiaphragm paresis (reduces pulmonary function by 25-30%) because of the close proximity of the phrenic nerve. Hence, it is contraindicated in respiratory insufficiency or contralateral nerve palsy. 5. Severe hypotension and bradycardia may occur during shoulder procedure in sitting position under Interscalene block due to Bezold-Jarisch reflex. The Bezold-Jarisch Reflex responds to noxious ventricular stimuli (reduced cardiac venous return, pain, fear) sensed by chemoreceptors and mechanoreceptors within the Left Ventricular wall by inducing the triad of hypotension, bradycardia, and coronary artery dilatation. The activated receptors communicate along unmyelinated vagal afferent type C fibers. These fibers reflexively increase parasympathetic tone. 6. Other possible complications are: Pneumothorax, Epidural or subarachnoid injection and Accidental vertebral artery injection. Landmark: In the interscalene groove, about 1 cm superior to the clavicle and lateral to the subclavian artery. Coverage: At this level, trunks are tightly bundled vertically on top of the first rib and just posterior to the subclavian artery as it prepares to dive under the clavicle and hence, provides excellent anesthesia for the entire arm and hand. Due to close proximity to the apical pleura, this approach has the highest incidence of pneumothorax. Horner’s syndrome and diaphragmatic palsy occurs less frequently than in interscalene approach. Landmark: In delto-pectoral groove, 1 cm below the clavicle. Coverage: It is performed at the level of cords and provide good anesthetsia for hand, forearm, elbow and lower arm. At this level, musculocutaneous nerve has not divided and will be blocked. There’s no change in pulmonary function. Landmark: Just superior to the pulsation of the axillary artery at the lateral border of the pectoralis major muscle in abducted and externally rotated arm. 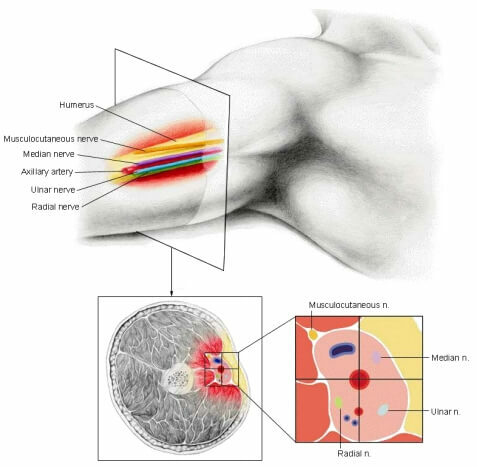 Musculocutaneous nerve must be blocked separately by injecting LA in the belly of coracobrachialis (located medial to biceps). Complications are least with this technique, however intravascular injections may be more common than in other approaches.